The discreetness of this event and at the same time the aggressive attitude towards the fellow-artists I shared the studio with have overlapped: I used the possibility to adopt the entire space for myself, filling it with water, documenting that and right after clearing the whole installation. Such gesture meant conquering the space and at the same time usurping it. 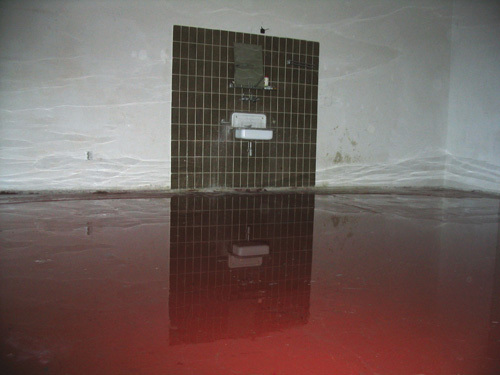 The entire surface of the floor was covered with water, deep enough to wet the shoes, and that limited the approach to the depth of the room. The entire space was completely changed, the floor gained a different colour, the inward space of the room seemed changed, and the light had different quality. The water surface became mirroring and the whole space got an unexpected depth of its visually doubled projection. The “Water Stain” does not represent a trace of the body in the space, but the trace of the space in the body.